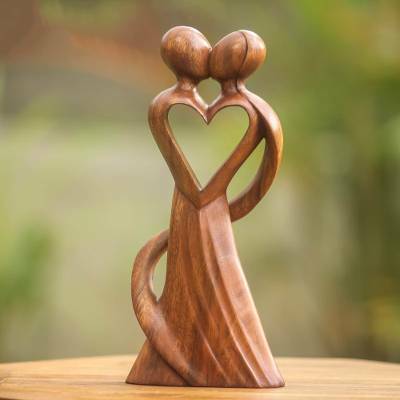 Original Wood Sculpture Hand Carved in Indonesia, "My Heart and Yours"
You can find wood statuette 'My Heart and Yours' by Wayan Rendah in sculpture categories such as Romantic Sculpture, Heart Shaped Sculpture and Wood Sculpture. Enjoy exploring these sections for other Novica treasures. "Always a great purchase "
Everything I've bought my wife has been absolutely fabulous! Such beautiful work and well crafted. Will continue to purchase these works of art for my family, they always please. I bought this gift for my daughter as one of her wedding presents. She was thrilled when she received it. It represent their eternal love and house decor. It was a Valentines day present and he likes it so much he doesn't want to put it away. Exquisitely carved and beautifully wrapped. A cherished memento. It's also very reasonably priced.